Mirabilia are marvels; according to Free Will astrologer Rob Brezsny they are mysterious revelations, rejuvenating prodigies, ineffable breakthroughs, strange amazements, rare delights and sublime sublimations! May we have the senses to perceive them around us. As for the first marvel: A wolf entered California for the first time in almost a century on Wednesday. He is a young male from Oregon, wearing a GPS collar, and is wandering in the snow-covered Siskiyou Mountains. I am really heartened to see the slow comeback of the wolf in the last fifteen years under the protection of the Endangered Species Act. The wolf, sacred in so many cultures, had the great misfortune to be linked with the devil in the dogmas of the Christian Church. Today, it is the cattle ranchers doing the demonizing and exaggerating the threat to their herds. 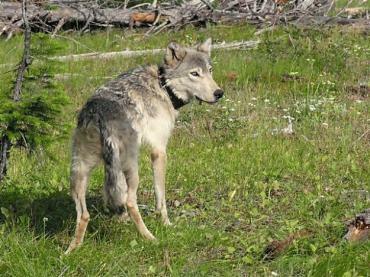 This trekking of the young wolf is a historical moment, and I feel a significant sign in the re-wilding of the state. Another marvel close to home is the recent appearance of harbor porpoises hunting for fish in the Golden Gate and entering San Francisco Bay in growing numbers for the first time since World War II. Scientists are studying them to determine why they have returned. Probably the cleaner waters resulting from almost four decades of the Clean Water Act are a big factor. In the old days sewage was dumped right into the bay. I hope to be able to walk out on the bridge and see them spinning in the new year. A third local marvel is the survival and hope for the future of the Franciscan manzanita. Manzanitas are gorgeous shrubs with leathery pale green leaves, burgundy to chocolate satiny bark and edible berries that once were important in indigenous economies, and currently loved by black bears. 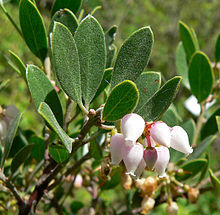 Franciscan manzanita is endemic to the city of San Francisco. In 1947 botanists heroically stood in front of bulldozers at a construction project that destroyed the last stand. Although they were unable to save the plants they were able to grow seeds in a botanical garden, but the species was believed extinct in the wild until 2009 when Dr. Daniel Gluesenkamp rediscovered the Franciscan manzanita, presumed extinct in the wild for over 60 years. Driving across the Golden Gate Bridge into San Francisco and the Presidio, he somehow sighted one surviving bush. Shockingly Caltrans (state highway agency) transplanted the last specimen to make way for an access road to the Bridge. It took until this fall for it to be proposed for formal Endangered Species Act protection: this means creation of a binding recovery plan for the species, and would prioritize federal funding for the species’ recovery efforts, including habitat restoration. May the Obama administration follow through, and may this wondrous manzanita thrive again!